V.I. 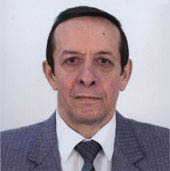 Dybkov graduated from Taras Shevchenko Kyiv State University (KSU), Department of Chemistry, Chair of Physical Chemistry, in 1971. During 1971-1974, he was a post-graduate at KSU. *Received his first scientific degree of Candidate of Chemical Sciences (Ph.D.) in Physical Chemistry from KSU in 1975. *Joined the Institute of Problems of Materials Science (IPMS), National Academy of Sciences of Ukraine, in 1975 as Junior Research Scientist and now is Leading Research Scientist at the Department of Physical Chemistry of Inorganic Materials. *Received his second scientific degree of Doctor of Chemical Sciences (DSc) in Physical Chemistry from IPMS in 1994. *The main publications are devoted to solid-state reaction kinetics, phase formation in binary and multicomponent systems of different chemical nature, and dissolution of solid metals and alloys in metallic melts.